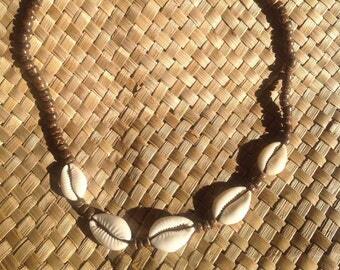 Authentic Hawaiian Puka Shell Necklace. Perfect For Both Male & Female. Gift, Beach Wedding, Groom, Luau Or For Polynesian Events Favors!! Sorry, this item is sold out. Have TiareOPatitifa make something just for you, or try these other items. 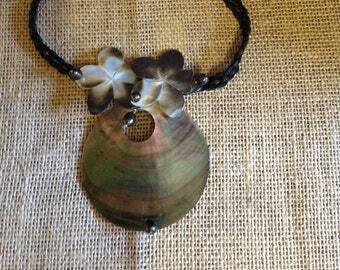 Tahitian Mother Of Pearl Shell With Pearls Necklace. Perfect For Girls Of All Ages. Wedding, BRIDESMAIDS, Gift, Polynesian Dancers, Luau. 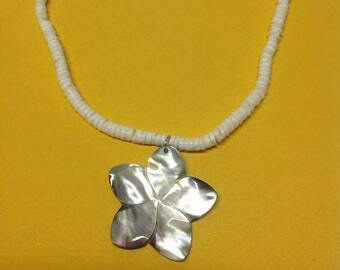 Puka Shells With Mother Pearl Shell Flower. easures 18" Long. Perfect Gifts, Beach Wedding, Or To Wear Everyday With Your Island Style!! Feather Necklace..Perfect For Tahitian And Cook Island Costume. Authentic Hawaiian puka shell for young kids. Perfect for both girl and boys!! Necklace measures 14"-15" long.